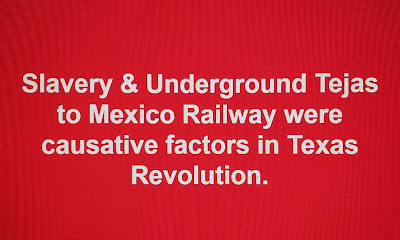 The significant role of slavery in the Texas Revolution along with the Tejas to Mexico underground railroad, were very well documented in 1/19/2019 presentations given at the African American Museum of Dallas by Dr. Marvin Dulaney, retired UTA History Professor, and Ms. Maria Esther Hammack. Ms Hammack is a graduate student working on her doctoral thesis. She spoke in detail of the documents she has found documenting the underground railroad for slaves escaping the South and Texas to go into Mexico where it was well known they could live free. Ms.Hammack's documentation included several documents about two slaves who ran into Mexico to escape Sam Houston, who is documented as "purchasing" them for $2,100. She had a copy of his letter attempting to find a bounty hunter to track them down. She also had documents about the substantially successful and prominent life they enjoyed in Mexico. There are currently several million Mexicans of African American descent living in Mexico. At least 2 Presidents of Mexico have been Black. Two af Sam Houston's slaves he valued greatly escaped into Mexico! Both speakers told of the struggles to get these facts into Texas textbooks for students. The underground railroad hypothesis is the newest one and is being established with this doctoral dissertation which will be defended in the next month or 2. Her work is impressive! 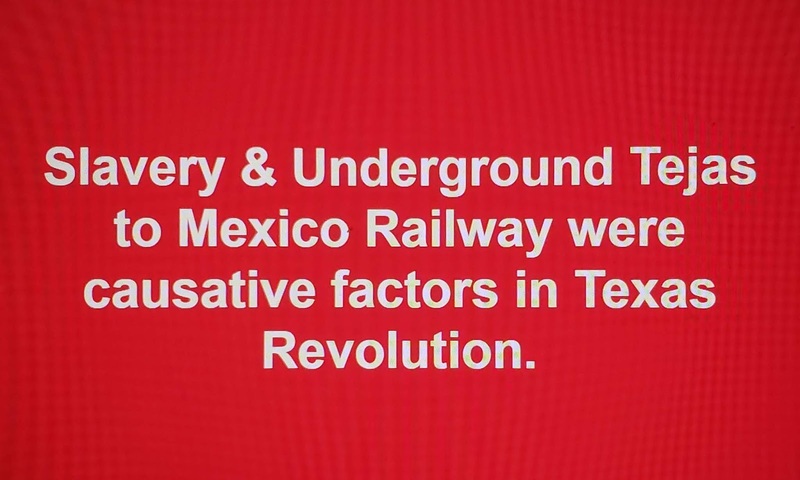 It's a shame that the role of slavery in starting the Texas Revolution is not covered in our history books. Become a member of the African American Museum to support truth in history! The presentations were video taped. Hopefully they will be available to be seen, possibly on the African American Museum of Dallas website. This was a very powerful day with a very engaged, active audience with many many questions. On Thursday 1-24-19 at 5:30 pm, just before the DISD Board Meeting, there will be a Public Hearing on the Annual Report of Performance on Texas Academic Performance Report (TAPR) for 2017-2018 (25 pages), and the 2017-2018 Evaluation of the Effectiveness of Accelerated Instruction, (169 pages.) Public 3-minute testimony will be taken but you must call to sign up just as in DISD Board Meetings. 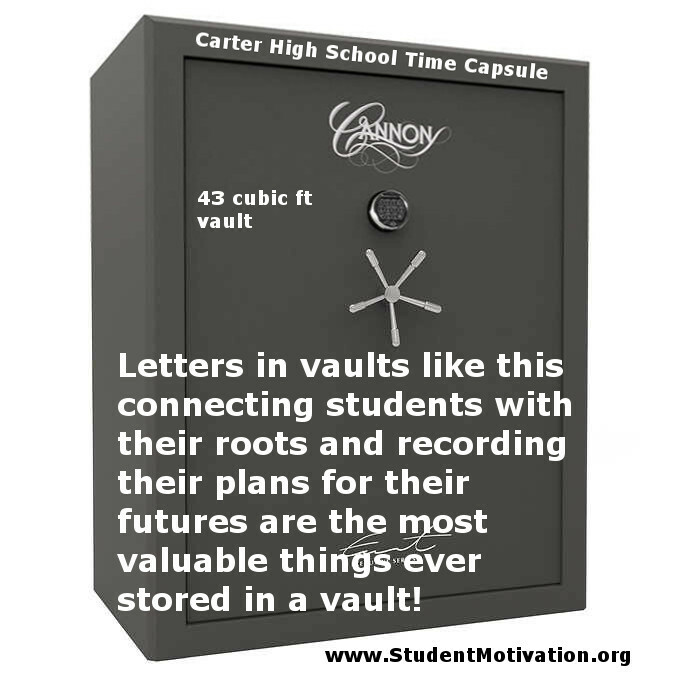 The links provided above go to the collection of each of these sets of reports that are on the TEA web site or the Dallas ISD web site and go back over 15 years, each representing a huge volume of information. The complete report DISD is required by law to release can be studied at https://www.dallasisd.org/Page/873. Dallas ISD teacher turnover 2006-2011 was 2.8 points lower than Texas teacher turnover. But since 2013 Dallas ISD teacher turnover has exploded, even related to the rest of Texas which has also gone up, and DISD teacher turnover is now 3.7 percentage points HIGHER than the Texas average teacher turnover! This is data taken from the TAPR reports linked above for the years 2006 to the present checking for DISD Teacher turnover and Texas teacher turnover. In 2018 DISD continued to be 1.8 percentage points higher than Texas, 18.4% teacher turnover in DISD compared for 16.6% turnover for Texas. 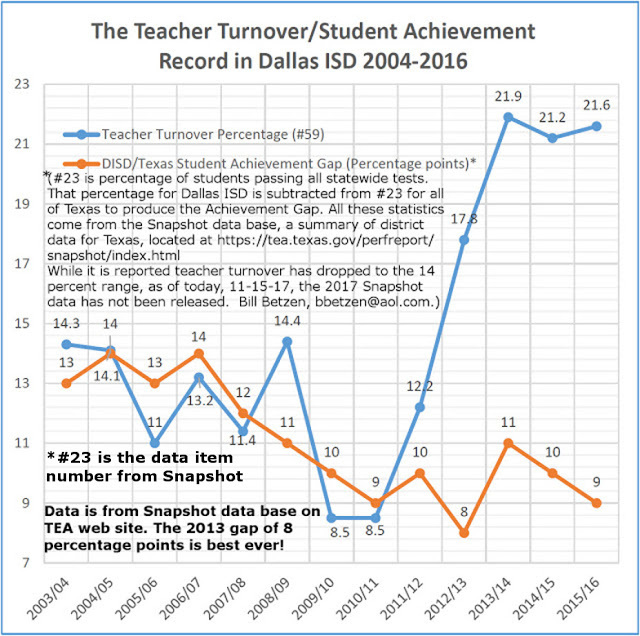 Remember, from 2006 through 2011 DISD had a teacher turnover percentage that even went as low as 8.5% two years in a row, and was on average 2.8 percentage points lower than the rest of Texas. Then in 2013 teacher turnover in DISD exploded! See charts below. 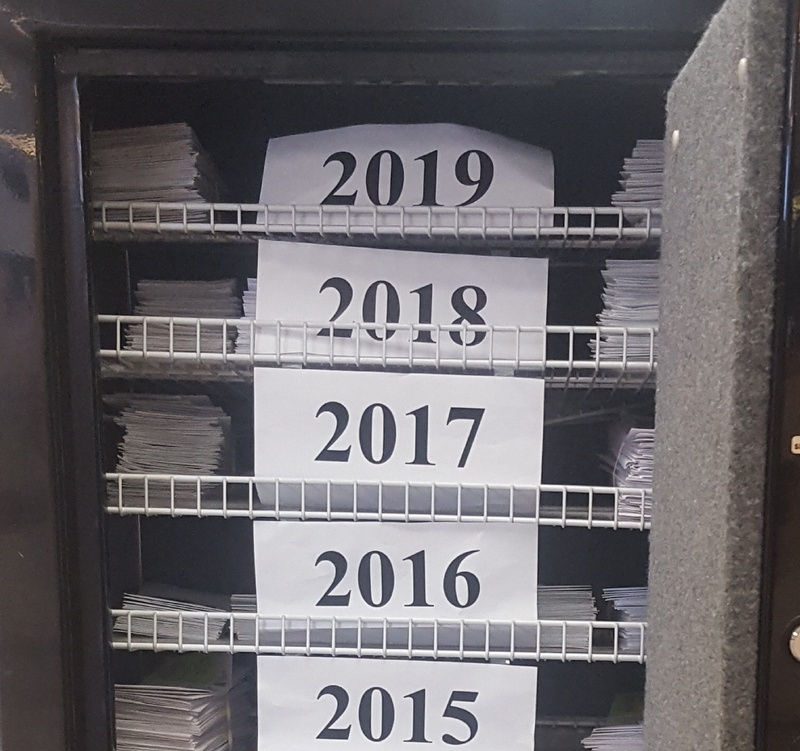 The first one has the data for 2017 and 2018. Regarding the Teacher Turnover and Student achievement: we now know student achievement improved so that the gap with the state shrunk to 6 percentage points in 2017/18. 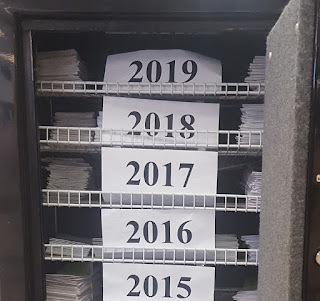 That is wonderful progress! 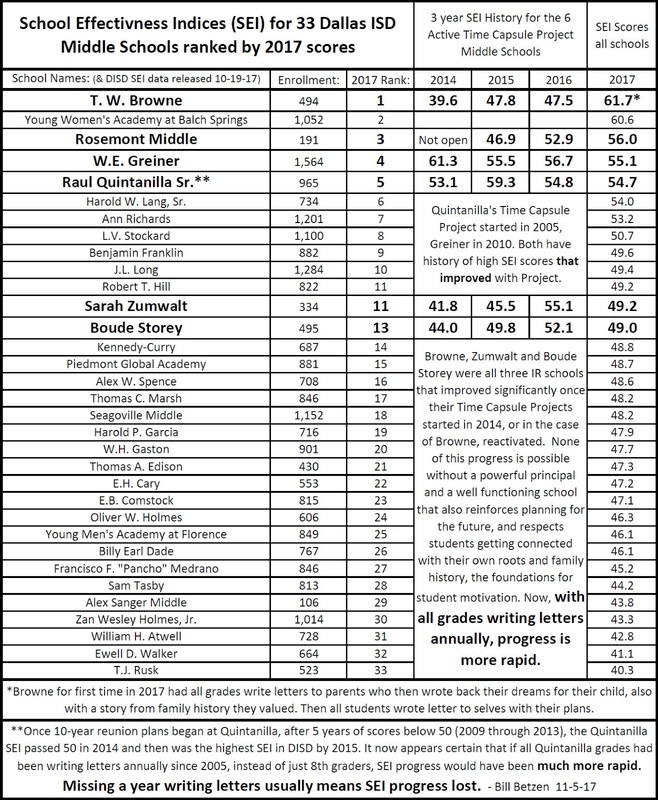 In spite of the handicapping poverty level among DISD students that was 28 percentage points higher than the rest of Texas, DISD students passed statewide tests to the point that the state only had a passing percentage that was 6 percentage points above the percentage passing in Dallas ISD! Just 4 years earlier that DISD/Texas Student Achievement Gap had been 11 percentage points. This is the second time in DISD History that the DISD/Texas Student Achievement Gap has gone down 5 percentage points within 4 years. The first was from 2007 to 2011 when it went from 14 to 9 percentage points. The second was from 2014 to 2018 when it went from 11 percentage points to only 6! The 2017/18 TAPR reports had some very positive news about the DISD/Texas Student Achievement Gap. It has improved! In 2017 it was down to 8% again, finally matching the 2013 achievement. In 2018 it went down two more points to 6%, the smallest gap in recorded history! That should have happened in 2014. DISD student poverty rate was recorded in this 2018 TAPR as being 86.7% while the Texas rate is 27.9 percentage points lower, or 58.8%! 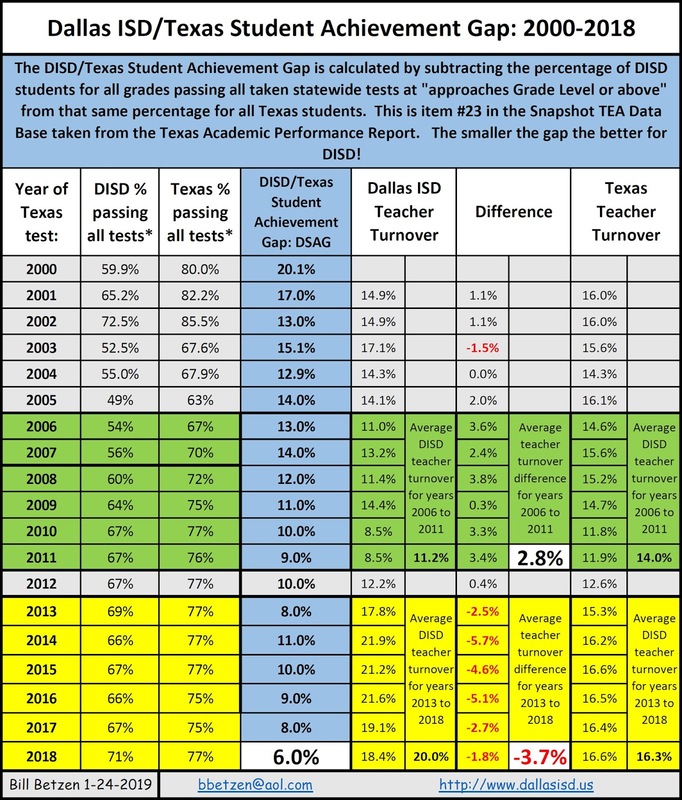 In spite of a student body with a poverty rate 27.9 percentage point higher than the state of Texas, DISD was able to lower the gap between DISD Students and Texas to ONLY 6 percentage points!! That is less than 1/3 of what the Achievement Gap was in 2000! DISD has progress to celebrate, and much more work to do to stop double digit teacher turnover. The Young Women's STEAM Academy in Balch Springs has been the highest SEI scoring Middle School for two of the past 3 years. That third year they were not the highest scoring they were in second place!! This wonderful school is composed of about 1,200 girls 99% minority and 91% economically disabled. 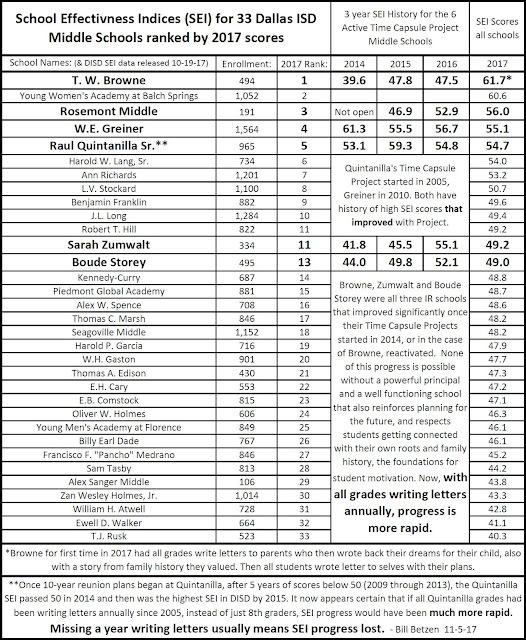 It is also the lowest funded by pupil of any middle school in Dallas!